Ume-Kawaii Suppa-Mucho chips. Well isn't that a bit of a mouthful to say? Before reading what these chips actually even were, they were already in my basket. The cute packaging had already won me over. It looked to me like something following the unicorn craze that swept the States last year. I loved it. 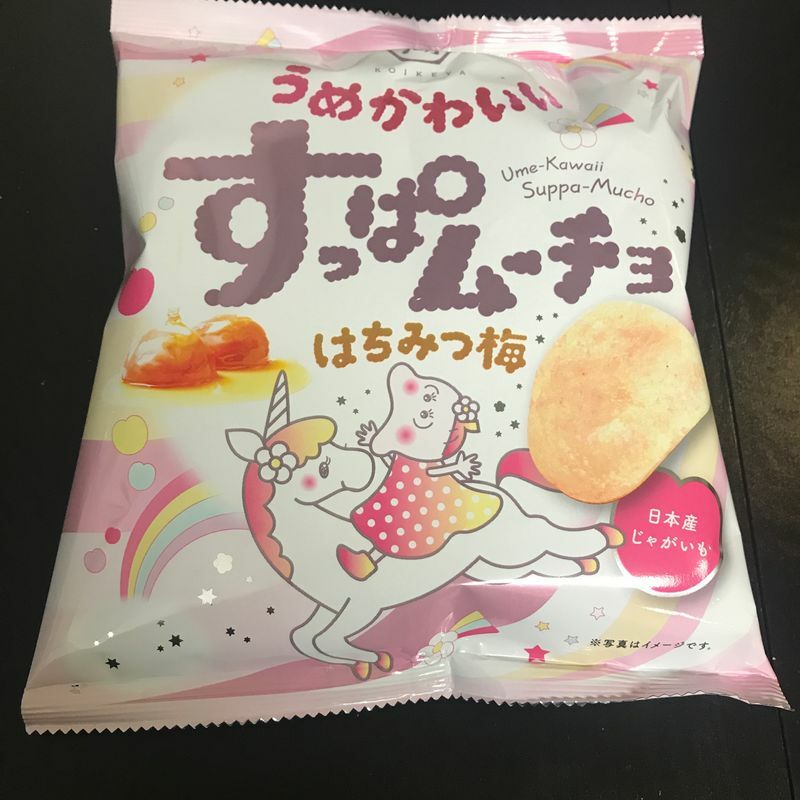 If you are familiar with the chip selection in Japan, you may recognize the elderly woman riding the unicorn. If not, this kawaii'd out granny is the kara-mucho chip mascot from producer Koike-ya. It seems they're back at it again, but not with a spicy chili chip. 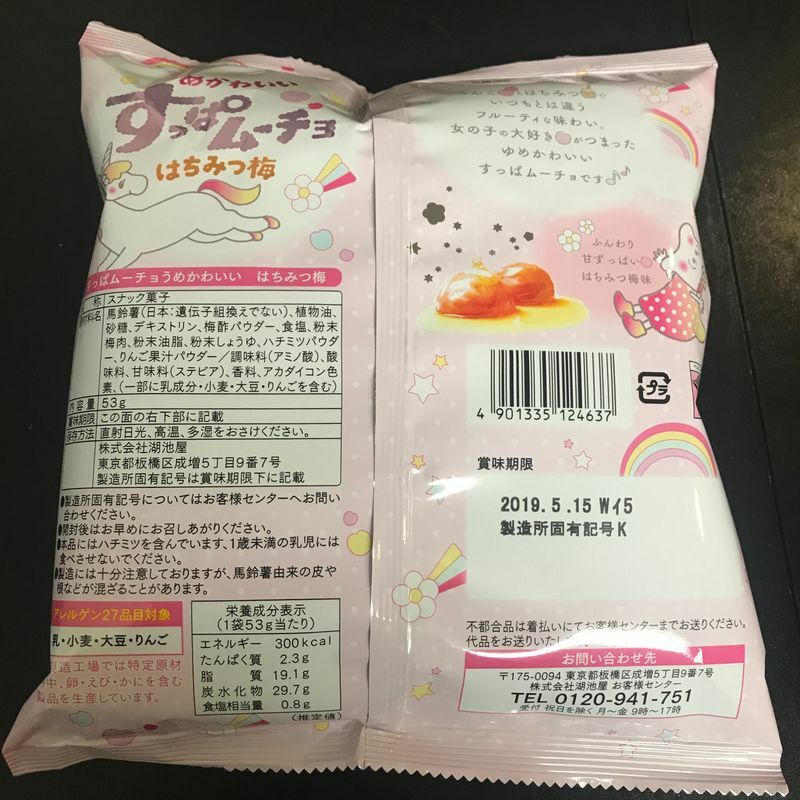 Instead, they released another suppamucho chip, this time in a honey plum flavor. I guess the packaging makes sense when you consider the flavor. Honey is a sweet flavor, and Japanese plums have a delicate color associated with them. Now, neither of these flavors belong on a chip in my humble opinion, but I'm an openminded person. I'd take my chances and taste them before forming an actual opinion. 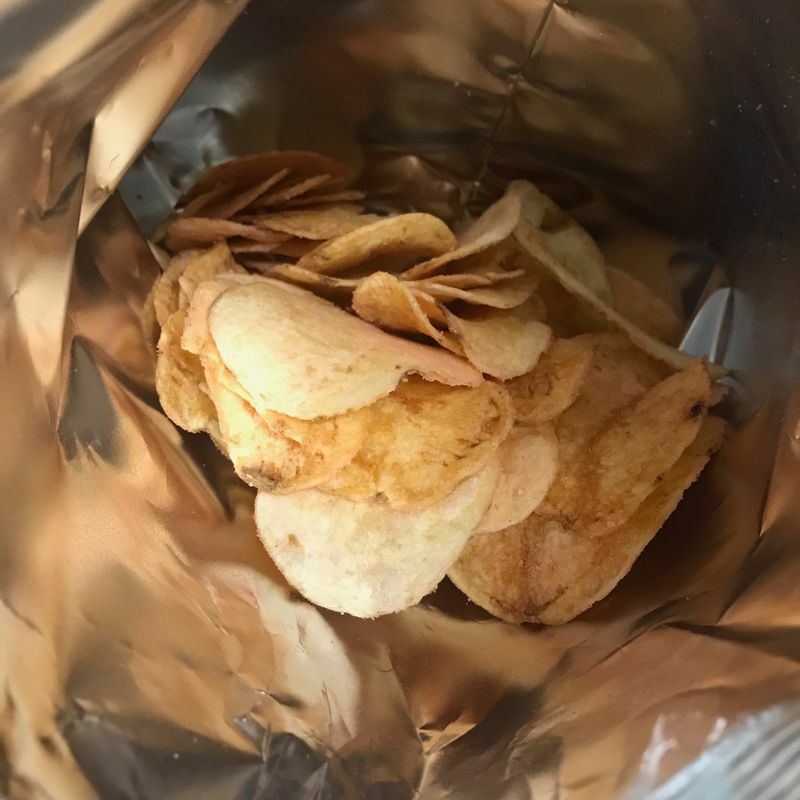 Though it's a bit difficult to see above, the chips were actually coated with a light pink powder. 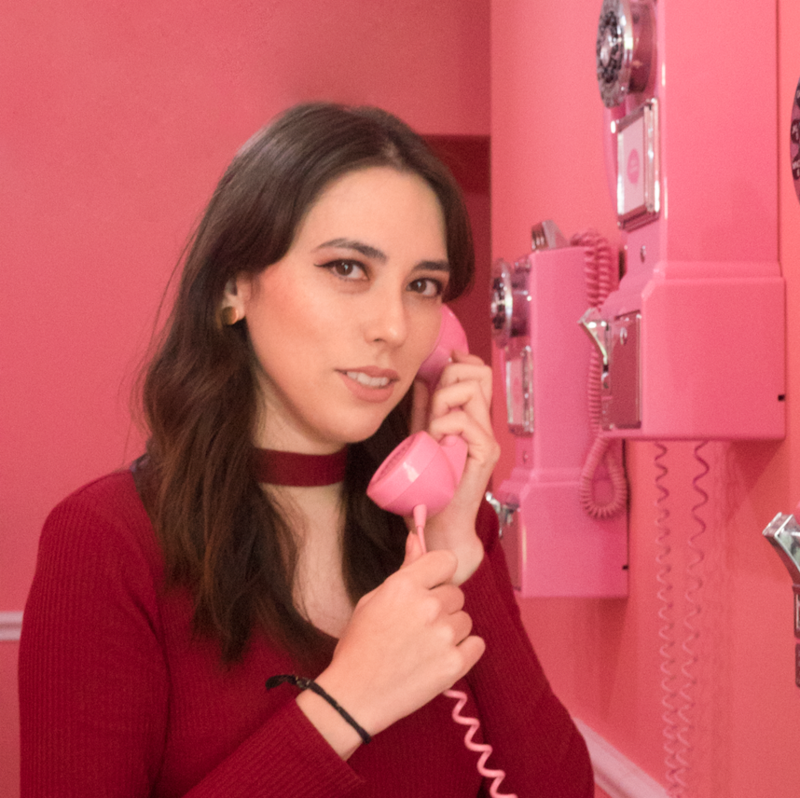 It was certainly the first time that I had ever eaten a pink potato chip before, as that bright color isn't something I normally associate with food. I hesitantly took my first bite and it was probably one of the grossest things I've ever willingly eaten. 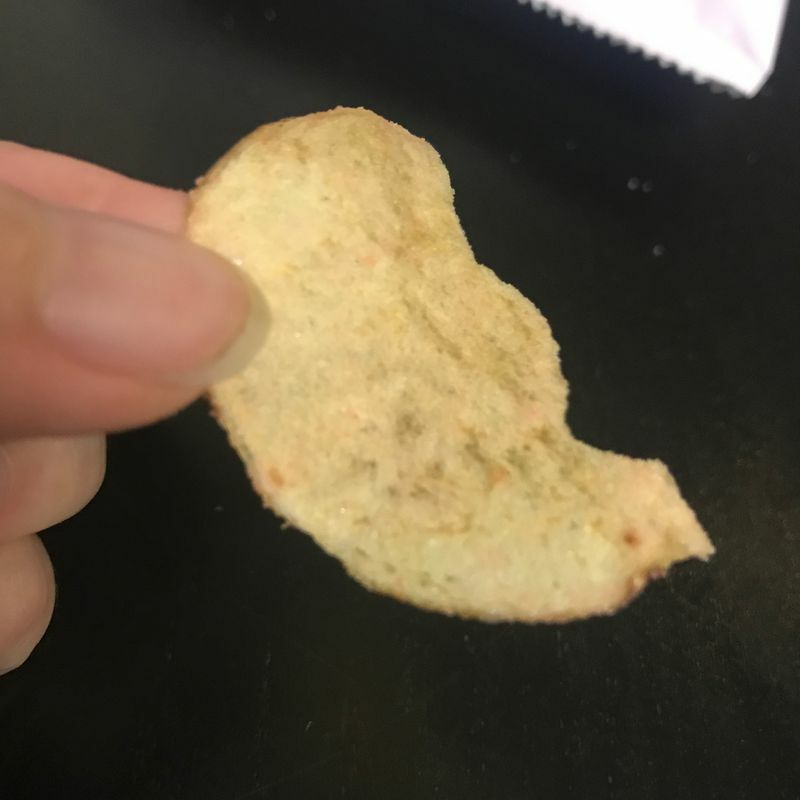 I understand that Koike-ya was trying to go for a sweet-salty-sour profile with these chips, but it was more like a sour punch to the tongue, salt cheering the harassment on, with honey acting as aftercare but too little, too late. The karamucho granny definitely looks cute here, but her Harajuku-inspired makeover just didn't suit her. She should go back to embracing her traditional looks and stick to the spicy chips.